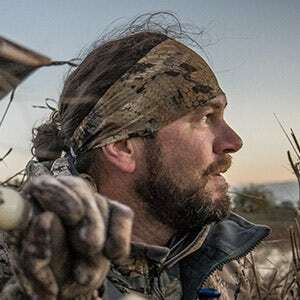 Hailing from Amarillo, Texas, Erik Guggenheim is a career waterfowl guide and has spent the past 22 years traveling the world in pursuit of fowl. A graduate of Harvard Business School and an original founder of Ranger Creek Goose, he has since “retired” to focus on what he loves – guiding. From the High Plains and Front Range of Colorado to West Texas, Canada and even South America, if he doesn’t have a goose call in hand, he no doubt has his camera nearby to capture the incredible moments on the hunt. My Grandad was an avid waterfowler and bird hunter. I still do it because its part of my DNA. Like an ever present voice. I can't drive past a field and not think how I would set up or how the geese would approach. For me I start early with my trailer. It is set up for every condition, all my gear, everything is in there. When I show up to a field I just pull according to the surroundings. Goose hunting over a peanut field. If you have done it you will know why. I have seen men come on their last hunt before dying. Talk about pressure to perform. But after it was over they just want to sit and watch the birds land and soak that in. My soul is quenched by mornings in the blind, but it is not the harvest that defines me. It is the mastery of the art, and I shall always be a student.